I realize it’s tax week and I should be condemning our convoluted tax code and oppressive IRS. But I can’t resist getting diverted to another topic. It’s time to debunk the notion that there is rampant sexism in the private economy that causes women to by systematically underpaid. I addressed the issue back in 2010, citing the solid work of Christina Hoff Summers. And I cited more of her work, as well as some analysis by Steve Chapman, when writing about the topic in 2012. The bottom line is that rigorous analysis finds that the so-called gender gap largely disappears once you consider factors such as occupational choice, hours worked, and education. I’ll add my two cents to the discussion. For decades, I’ve been dealing with leftists who repeatedly tell me that business owners are consumed by greed and put profit above everything. Yet if women truly were making less money than men for doing equal work, then why aren’t these greed-filled business owners firing all their male employees and hiring women who will work for 80 percent of what it costs to employ men? Or 85 percent? Or 90 percent? When I pose this question, my statist friends begin to mumble and stumble, but the clever ones eventually asset that business owners are not only soulless profiteers but also malign sexists. And the sexism apparently trumps the greed because they’re willing to employ men when equally competent women would work for less. At that point, I usually ask them why entrepreneurs (presumably women and perhaps financed by rich leftists) don’t take advantage of a huge competitive opportunity by setting up rival businesses that could hire women for less money and lure customers away from the greedy sexist firms by charging lower prices. I still haven’t received an answer to that question. And that may explain why even one of President Obama’s top economic advisers basically admitted that equal-pay propaganda from the left is completely bogus. Let’s dig into the data. Mark Perry of the American Enterprise Institute does a very good job of explaining why Equal Pay Day is based on nonsensical numbers. By the way, all this data and research doesn’t mean sexism doesn’t exist. I’m sure it does, and it probably goes both ways. I’m simply saying that unjustified discrimination in a competitive market economy is expensive. People who put prejudice above profits suffer. Which is why there’s so little actual evidence to support the feminist position. Now let’s enjoy a bit of fun. It’s always amusing to expose statist hypocrisy. The Obama White House claims to believe in so-called equal pay for equal work. But apparently that’s only a rule for us peasants. 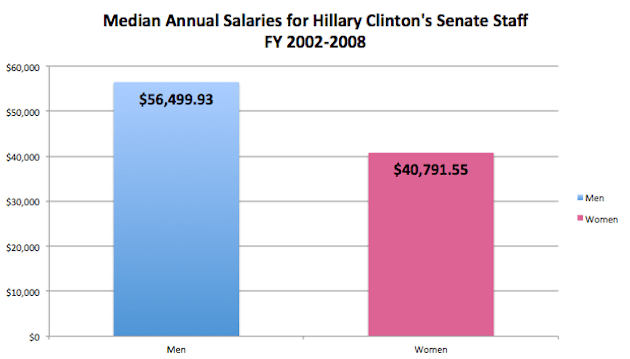 And Hillary Clinton doubtlessly will regale us with speeches about equal pay over the next several months. Yet she didn’t practice what she preaches. Yes, I realize we’re all shocked that politicians like Hillary prevaricate and dissemble. P.S. Since this is tax season, I suppose I should close with a couple of relevant items. 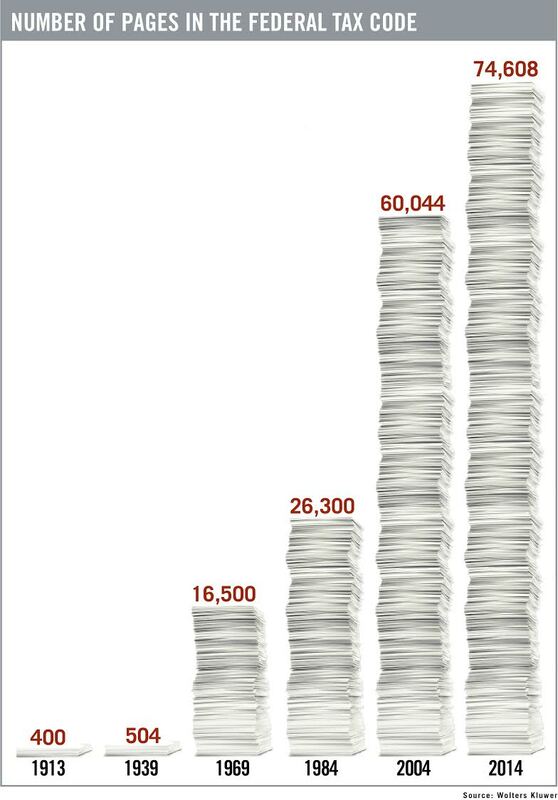 First, we have an update to the infamous chart on the number of pages in the tax code. Sadly, I don’t think my tax videos will ever be that entertaining. when ideologues gain power… and begin imposing nonsensical policy on a reality based world the fireworks start… politically correct thought has morphed into a sick joke… being played on innocent people around the globe… it is degrading our economy… dividing our society… and allowing the misallocation of social… political and financial resources..
and now granny Clinton steps forward… with her cadre of miscreants to bring social justice to American soil…. the era of “depends” is upon us… and the new face of American exceptionalism ………………. has wrinkles……. Because what this political movement wants is not equal reward for equal production, but rather, an affirmative action society that subsidizes and supports women in their choices and biological functions. The rationale is that since they view the inevitably and exclusively female functions (such as child bearing) as everybody’s business, they simply want men to subsidize motherhood in the general spirit of social solidarity. And they want this motherhood to be supported not at the independent family (or even extended family) level, but at the coercive national (and even international) level. They want the rest of society to stay out of their reproductive choices, except for when they decide to exercise them, in which case others are obligated to subsidize them. They want, for example, to unpredictably take five ten years off from work to have children and return to the same salary progression trajectory as someone who never left work. They want a subsidy for their reproductive choices and functions. Perhaps more importantly, they want to expand this subsidy and delegation of family member responsibilities from the voluntary family level to the coercive national level. Because they view the whole nation as a big family. You know… “it takes a village”. Actually seems like “it takes a continent”. And according to the OECD “vit takes ze hol vorld!” “Be absorbed and harmonized or perish in the prosecution of the big homogenizing progressive machine!” . Except that it won’t work. At some point, as the distortion and homogenization proceed, the benefits of rebuffing the big harmonizing machine start outweighing the risks of its retaliation, and the whole coercive collectivism empire begins to collapse. Then the cycle repeats. Of course human progress and evolution would be much faster if it did not go through these extended authoritarian coercive collectivism flare ups (and resulting oppression, warfare and destruction) but voter-lemmings still have this collectivist behavior baked in their genes from a primeval time when the pie was indeed finite (or simply expanding at an excruciatingly slow, imperceptible pace). So, in a nutshell, voter-lemmings are still attracted to coercive collectivism by genetic heritage, and since women are a marginal majority in most countries, it does not take much for their movements to impose their will, preferences and desires in a modern democracy. So, you will obey! …Adopt… and support… the reproductive and family choices of the majority! Having achieved equality of opportunity, present day feminist organizations, like many other organizations are primarily occupied with promoting the interests of their members using the political process and the democratic imposition of majoritarian preferences and interests on minorities. It’s the same reason why people with children want childless people to subsidize their proliferation through child tax exemptions and credits. It’s the same reason why married people want unmarried people to subsidize their nest building through the preferential “married” tax rates. But,… almost by definition,… it is always the exceptional minorities that primarily lead the way to innovation and an ever rising standard of living. Societies that prosecute these minorities, try to forcibly draft them into the fold to serve the perceived homogenized communitarian causes, are less productive societies — And their production deficit quickly compounds them into decline and oblivion. Surpassed, forgotten. You forgot to mention that every citizen is charged with knowing what the law is; that includes those 74,608 pages of tax code. PS. An elected office is a terrible thing to waste by putting a politician in it. Why can I NOT share this on Facebook?